Slipped Disc | Breaking: Met settles with stage unions. Another surrender. Breaking: Met settles with stage unions. Another surrender. IATSE, the main stage union, has just announed the Local 1 has reached agreement with the Met. The terms are another humiliation for Peter Gelb. Gelb has been trussed up hand and foot in these talks, left with no room for manouevre on future policy change – unless he gets the approval of the unions and the independent budget monitor. What began as negotiation ended in total capitulation. The tentative agreement we reached today – which includes mandatory cost reductions from management and an independent monitor to track budget performance– offers a way to get the Met on a track for success. We look forward to presenting the details of the agreement to members of Local 1 for their decision on ratification. And we’re committed to remaining at the bargaining table to conclude agreements for the other six I.A.T.S.E. local unions whose members make the magic happen at the Metropolitan Opera at every performance. New York, NY (August 20, 2014) – The Metropolitan Opera announced tonight that a new labor agreement has been secured with IATSE Local One, the union representing the company’s stagehands. Final negotiations will take place tomorrow with eight smaller unions representing behind-the-scenes Met personnel. All are expected to reach agreements, preventing a potential labor crisis at the nation’s largest performing arts organization. The new contract with Local One, subject to ratification, will provide the institution with savings comparable to those achieved through the recent agreements with Local 802 (which represents orchestra musicians and librarians) and AGMA (which represents chorus, principal singers, directors, and stage managers). Pre-season rehearsals and preparations for the 2014-15 season will continue without interruption. The Met season will open as scheduled on September 22 with a new production of Mozart’s Le Nozze di Figaro and continue with 221 performances of 26 operas in six new productions and 18 revivals. So the Met and the unions have come to an agreement that should save the company about $30 million a year and the current season will go on without so much as a single day’s interruption in rehearsals, and yet the only prism through which you see this news is as a personal humiliation for Peter Gelb. Never mind the thousands of jobs saved or the avoidance of a canceled season that migh permanently shut down the Met: the only priority is sneering at Peter Gelb. Wouldn’t it be more dignified to do as the other children on the playground do, and just create fanciful insults about his mother? Lewes, the terms of all these settlements do seem to be much closer to the unions’ positions than to the goals stated by Peter Gelb. It is wonderful news that the season is saved and livelihoods are unhurt, but this doesn’t preclude the reasonable observation that management largely caved, notably in the matter of the new oversight mechanism. This is the language of an announcer at a heavyweight prize fight. In contract negotiations, the point is to come to an agreement, not to leave one’s opponent bloody and unconscious. Norman is a news man. He’s bringing you, us, a news service we don’t pay for. I think he’s allowed to paint in vivid colors if he chooses. The reader can discount for this. Entirely separately, I think leaving your opponent bloody and unconcious is precisely the objective in negotiations. What you describe is the mediator’s job. Newsmen, even those worst newmen in the world, British newsmen, deal in facts. Lebrecht is a gossipmonger, dealing in innuendo and invective. He delivers a phenomenal service to me and to many others, and, since facts and transparency quickly trump gossip in today’s world, I don’t see how your complaint adds up to much — beyond sour grapes and ingratitude. And, sdReader, let me be clear that I don’t regard the outcome of these negotiations as a blazing victory for Gelb. Rather, it’s a compromise; half a loaf, as the proverb puts it. In this case it’s maybe even closer to a third of a loaf. But the positives are clear: the negotiations are completed and contracts are ready to sign for a four-year work periods for the Met’s major unions. Labor costs have been lowered for the first time in more than 30 years. Giving the unions a greater stake in the Met’s overall financial well-being will, I think, over time lead to a greater sense of teamwork instead of the adversarial relationship between unions and management that has until now prevailed. This more collegial relationship between labor and management is on trend with labor relations in general in the United States. The point of this exercise is not for Gelb or the unions to be King of the Hill, but rather for the Met to produce opera in a way that balances artistic vision with prudent financial sense. I think this agreement is generally helpful to this mission, and as such I regard the this completion of negotiations as a success. Yes, a third of a loaf. You have changed your tune. Two days ago you were claiming a triumph for Gelb. Our information is based on sources within the negotiating room and on years of close observation of the personalities involved. Yours? Show me where I said “triumph.” One would think that given your dismal history of journalistic inaccuracy, you would by now have learned to check your facts before blabbing in print. I reviewed my comments, and the strongest thing I ever said was that Gelb “succeeded.” It’s lucky for you that blogs can’t be recalled and pulped or else you’d be reduced to standing on a street corner screaming at passers-by. Actually I spoke yesterday with an attorney who specialized in American labor law, and he told me that labor’s agreement to any sort of reduction in compensation (without any equivalent rise in another area of compensation, that is) is in fact quite rare, absent imminent bankruptcy on the part of the business in question. Ordinarily holding union compensation flat relative to the previous contract is regarded as a victory on the part of management; the most usual expected outcome is a relatively small rise in compensation equivalent to the rise in the cost of living index. As I understand it, the last time the Met unions agreed to a “giveback” was in the mid-1970s when the company was in extremely dire financial straits. Anyone who knows anything about opera scheduling is perfectly well aware that occasionally artists are booked for roles years ahead and then find the role is not right for them. The great Janet Baker, an artiste loathe to cancel for any reason, was billed to sing Alceste at the Edinburgh Festival. After learning the role, she felt the tessitura was too high for her voice at that time. The role was then taken over by Julia Varady. In other cases, operas are changed to accommodate the artists. The Met merely followed standard professional practice. Absolutely nothing out of the ordinary. And since Lewes’ memory is, as we have discovered elsewhere, more than suspect, to bolster his argument he fails to point out that the Royal Opera’s presentation of Faust opened on 4 April 2014. Ms. Netrebko withdrew on 28 February 2014 by which time it was far too late to change an opera already in rehearsal. And Lewes tells us this all happened “around a year ago.” Sorry Lewes, wrong again! It was less than half a year ago. Always best to check your facts, don’t you agree? But these are details. The point is, the Met has Netrebko in an exciting new role on the second night of the fall season, whereas the ROH and Vienna have a miscellany of second-tier singers performing “Faust,” an opera that has fallen out of fashion. Aaaah! So you’re Parterre Box’s mole inside the Met. I am not Parterre Box’s mole inside the Met. I am not anyone’s mole. I do read Parterre Box regularly, as most thinking, well-informed opera lovers do. Lewes has alerted me to Parterre Box. Up now I have read precisely one article from that blog. Now I see I should be reading it more often, and for that I thank Lewes. But it is disingenuous to suggest that an artist like Ms. Netrebko would permit the management of the Royal Opera to continue to sell tickets and get as far as starting to rehearse “Faust” in the knowledge that she would not be singing. That is misrepresentation in a legal sense but frankly mere fanciful thinking. The Royal Opera has an excellent reputation with its audience. Far more likely that Ms. Netrebko had not made up her mind – perhaps in view of the smaller size of the ROH. But I admit that is speculation. The last contract negotiations, which took place without any suggestion of the need for drastic cuts, were just three years ago during one of the worst years of the fiscal downturn. In that year, the Met needed $140 million in donations to break even. The fiscal picture was only marginally rosier than it is now, yet the company granted increases. True, Volpe was doing the negotiating but he was operating under the direction of the Met management and board. What financial model could have possibly led them to think increased expenses were justified? When Gelb took over the Met he stated that increased attendance and new sources of revenue would restore the company to fiscal health. Wasn’t it obvious three years ago that the plan wasn’t working? only substantive proposal has been to set up a financial oversight board with union representation to provide oversight over spending on new productions and the like. Frankly, I think this would be a nightmare. NO SELF-RESPECTING DIRECTOR would tolerate that level of hostile micromanagement. And what has happened? Virtually exactly what Parterre Box claimed no self-respecting director would tolerate. Gelb’s emasculation is complete! No doubt Lewes will once again claim that I should be quoting more as the context is wrong. Sorry Lewes. All Parterre Box suggested was a more workable approach might be to let the unions have a single representative on the financial subcommittees of the Board of Directors. But that didn’t happen, did it? Oh, and by the way, I am still awaiting your written apology for accusing me of lying “ALL THE TIME”. That, as you are aware, is a LIE. Dare I proffer an alternative view? Gelb has secured wage cuts (or limited rises), and a season which goes ahead. Whatever you may think of the initial negotiating position, these have been achieved. Moreover, allowing the unions “oversight” in budgetary matters may be more a clever move than capitulation. Before, saying to the unions “there’s no cash, we need lower wages” led to derision. Now, if Gelb was right all along, it’s the unions who bear a responsibility to look at the numbers and consider what is best in their members’ long-term interest. If the money really isn’t there, the unions will be the ones who have to go to their membership and offer the stark choice of wage cuts now, or no job in X years; it will be the unions offering this to their own members, not Gelb. In this scenario he has removed his bogeyman costume, and given it to the unions without them noticing. Of course, if Gelb was telling porkies all along then this isn’t the case and he deserves everything he gets; but I’ve half a suspicion he might be proved right in the long run. Well, any past porkies were presumably rooted out by the auditor, who is also now the man assigned to operate the new mechanism. I wouldn’t call the concession “clever” but would agree that the greater transparency could work in management’s favor. Yes, something has been achieved – but not much if you are Peter Gelb. If you spend months – yes, it was months – telling the world – and yes, it was the world for some of the early salvos were fired in a German magazine – that opera is staring into the abyss and that the only way to prevent the Met reaching that abyss is to achieve 17% cuts in overtime payments and benefits BUT very specifically NOT in basic salaries, and that you will lock staff out on August 1 unless such cuts are achieved, if you then cave in and achieve almost nothing in these crucial areas but instead gain some basic salary cuts, you look a fool. A poster on another thread has suggested Gelb’s many opening salvos were camouflage and that he wanted basic salary cuts in the first place. Granted, the art of negotiation is complex and full of strange byways and red herrings. But for the head of the Met to state unequivocally that he needs X and Y but ends up not just with a weak form of Z but is also thereafter shackled by a financial auditor who reports what he is doing to the Unions, that is a climb down on a very major scale. It is also a humiliation. His working life in the Met will never be the same again. I don’t understand why you think you can get away with lying all the time. Do you really think those few people who read Lebrecht’s blog are as stupid as all that? It is now established that those “few people who read Lebrecht’s blog” include your Principal Conductor. Now if you continue to pretend that this is not fact, there is something distinctly wrong with your though processes. Do you seriously believe that all those news outlets actually made up that Gelbism? So much for your higher standards of accuracy! Now will you kindly apologise for wasting so much of readers’ time. And next time will you kindly be less quick to suggest and less forceful in continuing to suggest that other posters are lying when in fact they are telling the truth. The trouble with people who lie and are caught out is that you, Lewes, cast major doubts over the accuracy of YOUR future posts. HOW IS IT POSSIBLE THAT THE WORLD’S BIGGEST, RICHEST AND ARGUABLY MOST SUCCESSFUL OPERA HOUSE IS CLOSE TO WHAT GELB SAYS IS “THE EDGE OF THE PRECIPICE”? Gelb chooses his words pretty carefully: if he’d intended to say, “We must have a 17% reduction in compensation or else we will go bankrupt” he most likely would have said that. Does nobody here understand how bargaining works? You propose a number, the other side proposes a different number, and then you start moving to the middle. Anyone who proposes a 17% figure as the very first gambit in a negotiation is not expecting to get 17%. 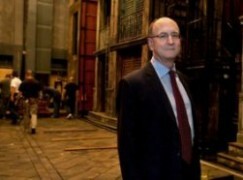 Gelb may not have run an opera company before he took on the Met, but he certainly had experience of negotiating contracts before he arrived at LIncoln Center. There is no direct quotation anywhere in which Gelb says either the unions agree to 17% cuts in the specific areas he proposes or else the Met will go bankrupt, or fall into the abyss or stand on the precipice or however you want to paraphrase it. He continually uses phrases like “rational, modest cost reduction,” a plausible, achievable goal which, in fact, he has achieved with these new contracts. Maybe the cost reduction is rather more “modest” than he might have hoped, but it is in fact the first cost reduction in union labor costs in more than 30 years. I realize that mere facts are not going to prevent the Lebrecht groupies from playing “gotcha,” but you might at least admit that you are indeed playing rather that considering the subject seriously. You won’t make much progress here by insulting other commenters, assuming that you’re being paid to coddle Peter Gelb’s reputation. I don’t see Scott as anyone’s groupie, and he wasn’t playing gotcha. You assume wrong: I’m interested in truth, not advocating for one side or the other. Your response is a bit disingenuous. Gelb was already on record of advocating (some would say “demanding”) a 16% cut, which was to be taken from the overall compensation of his union workforce. He did this broadly across the media, including his later interview with Paula Zahn. (This same case was made by the Board members when they took out their full page ad in the New York Times.) Hoelterhoff acknowledged this fact, and restated this number clearly as she set up her interview. And, she was asking Gelb to discuss those cuts… this was the basic premise of her piece. After this setup, he responded to her, “But we need a rational, modest cost reduction. Else we’re facing bankruptcy in a couple of years.” It is obvious in context that Gelb was referring to the 16% cut—which everyone was talking about and he himself was proposing—as being a “rational, modest cost reduction” and that if he didn’t get his “rational, modest cost reduction,” the company was facing bankruptcy. You might disagree with this characterization of the 16% cuts to his unionized workers as being rational or modest, but it is obvious that that is what he was talking about. If he was completely misquoted, or misunderstood, he would have said so (and done so loudly), because such a false statement would have enormous consequences to the negotiations and public relations battle. But he did not. Gelb never suggested that this was an opening bid… but made it clear that this was his offer, and he was willing to lock out everyone if they didn’t take it. This exact same procedure was followed by the Minnesota Orchestra, Saint Paul Chamber Orchestra, and other classical music organizations. The fact that he didn’t go through with his threat doesn’t mean that he somehow wasn’t making that threat. This is the key point those of us are making. And since the above comment was my first ever posting on this site, I’m not sure how I qualify as a groupie. Your use of ellipses in the “We have asked…” quotation is also deceptive. You took statements Gelb made several minutes apart and tried to make it seem like the “this change” had the antecedent “16% cuts….” which in context it did not. In the text you omitted, Gelb talks about cost savings in general, and Service quizzes him about various ways these cost savings can be achieved. “This change” obviously means the more general “cost savings” and not precisely the initially proposed cuts. I’m not going to respond further on this topic. You don’t understand how to quote accurately and so you’re basing your arguments on what you want to have heard instead of what you actually did hear. “Staring into the abyss” or “the edge of the precipice”. Dictionaries have difficulty separating the essence of those meanings. They are to all intents and purposes the same, the more so in the context frequently used by Peter Gelb in recent months. You are using semantics that do nothing to bolster your argument. As for the use of . . . in a quotation, you will know perfectly well this is standard practice when using quotes in journalism, academia etc. Most often they help focus the reader on the highlight of a text. Other times they are used to avoid unnecessarily lengthy comments. Since I have provided my sources, anyone can read the parts omitted. The essence of the quotations I included is perfectly clear in the context of the discussions on this thread. You have accused me of “lying all the time”. That in itself is an outright lie. I have written many posts on his blog over several months, You have falsely accused me of “lying ALL THE TIME”. Will you now kindly apologise? Agree 100% For decades James Levine was the Artistic Director and others served as General Manager concentrating mostly on management duties. With Levine’s resignation from that post in early 2004, the Board handed Gelb the entire cookie jar. No need to repeat once again his utter lack of experience for either job. But the need for a qualified opera Artistic Director is increasingly obvious. Looking at the earlier comments (see about 25 posts above), Lewes is clearly a pedant. He really loves semantics. Note, the word “triumph” was not in inverted commas and it was therefore not reported speech. It was a summary of what Lewes had written. But that is not all. Lewes now calls posters liars – not in respect of one post but lying “ALL THE TIME”. Apology time, Lewes. A significant number of the commenters on this thread have the style of one person’s writing. If just that one person stopped creating characters to argue with one another, the misinformation clutter would go down by an extraordinary amount. It is relatively easy to see that a number of posters started appearing around the time the Met controversy started, whereas others have been posting for longer – in some cases much longer. If people are posting under more than one handle, then I assume they have multiple ip addresses or from a proxy server as I further assume that NL and his team should be able to filter out those coming from the same one. I post only under this handle and have done so for more than 7 months, well before the Met crisis threads. I therefore discuss and argue with others, not myself. In this thread, I will take issue with you – in a relatively minor way. To the best of my recollection, the poster known as LEWES has appeared only recently. He called me a LIAR more than one. He stated that I LIE in ALL MY POSTS (and, I repeat, my posts go back at least to January).That is hardly the cut and thrust of civilised debate. I did not and have not lied. I assume from your post that if I were to announce that all your posts were lies, you would just sit back and consider it a cheap novel-ish sub-plot. Sorry, Amy. If someone calls me a liar, I defend myself. I also ask for a retraction. The coward who is LEWES has not done so. Would you do differently? Don’t know, Pamela, but I would check my meds. Oh dear! Since there is no post by Pamela on this thread you are clearly another of the crazies club! OK! Check back to January 20 and the thread “Claudio Abbado: Exquisite Maestro is no more. A First Appreciation.” Presently that is page 173). My post is #31 and in this I recount my own experience of working with Abbado. Then you can start to eat your own humble pie, dear spammer! *In this thread,* Amy and Scott I know to be real people and using their real names (albeit their given names only). I have no idea who any of the other people are. It’s a puppet show. Pure Punch and Judy. I *almost* care what fictional characters have to say about the Met negotiations, or which of them is the greater liar.